The Basil Baseasy Ii is made from stainless steel and is suitable for use with the Baseasy System II and Permanent-System II. Designed to provide a more sturdy connection when using Baseasy and Permanent System, the Basil Baseasy II will become a firm favourite. 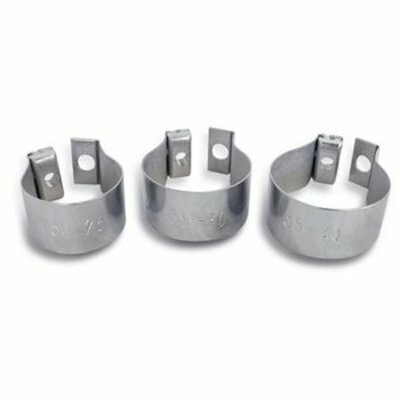 This clamp can be used for extra stability in moments, with these stainless steel ring holders providing your bike with unbeatable strength and security, and suitable for handlebar stems measuring 25 to 30 mm in diameter. An ideal option if you regularly use a basket or front-mounted bag, you’ll never regret purchasing this essential accessory. A long-term investment that’ll come in handy time and again, this is a must for nay cyclist who wishes to wish items to their handlebar. This stainless steel ring is available in sizes from 31 to 35 mm and from sixes 36 to 40 mm, ensuring you’ve the right choice for your bike. Curious about more must-haves from Basil? Browse the complete range online for all the essentials you’ll ever need. Constructed from stainless steel with silver plating. Suitable for men and women’s bikes. Designed for use with the Basil Baseasy System II and Permanent-System II.